The content of this article provides interesting history, facts and information about Roman Hairstyles for men and women. The Romans were extremely conscious of how they looked in public. The status of the Roman men was reflected in their style of clothes. However, the clothing styles and fashions of Roman women were relatively simple and unchanging and as women had no special dress that distinguished their status the wealthy women wore expensive materials, make-up, expensive jewelry and highly elaborate hairstyles and wigs. The Roman Hairstyles for men changed over the years. In early times the Romans wore their hair long but after the introduction of barbers into Italy about B.C. 300, it became the practice to wear their hair short. A full head of hair was prized by Roman men and Julius Caesar went to great pains to hide his thinning hair. It is said that of all the honors decreed to Caesar by the senate he was best pleased with that of always wearing a laurel crown, because it covered his baldness, which was considered a deformity. The leading figure during the period of the Roman Empire was of course the Emperor and if he adopted a new hairstyle then this was quickly adopted by other Roman men. The Emperor Nero (54-68 CE) adopted elaborate hairstyles with curls framing his face. Roman curling tongs were used for this purpose. Nero set another fashion in hairstyles and started to wear sideburns. The Emperor Hadrian (117-138 CE) was the first emperor to wear a short beard which then became quite common among Roman men. In his later years the Emperor Constantine wore false hair of various colors which was carefully arranged and perfumed. Wealthy Roman men followed his lead and dyed their hair in a variety of dark and light shades and the wearing of wigs also became fashionable. Roman women originally dressed their hair with great simplicity. One of the simplest styles of wearing the hair was allowing it to fall down in tresses behind, and only confining it by a band encircling the head. Another favourite but simple hairstyle was platting the hair, and then fastening it behind with a large pin. Young girls wore their long hair in simple buns tied at the base of the neck or wore their hair in a top knot. Simple hairstyles for married women changed during the reign of the Emperor Augustus when a variety of different and elaborate hairstyles came into fashion. The clothing fashions of Roman women remained relatively simple and unchanging and as women had no special dress that distinguished their status the wealthy women wore luxurious materials, highly elaborate hairstyles, make-up and expensive jewelry. During the rule of the Flavian emperors (69-138 BC) hairstyles were raised to a great height by rows of false curls. This fashion was described by the writer Juvenal as the hairstyles made women appear tall from the front but quite the opposite from the back. The hair of Roman women become elaborately curled. Hairstyles were elaborately arranged in layers. Hairstyles involved hair being twisted, waved and curled. Ringlets were created to create hairstyles which fell to the sides and the backs of the head. Wigs and hair pieces were used to create an illusion of abundant locks. 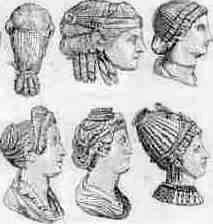 The picture of some hairstyles worn by Roman women are shown above. As the Roman Hairstyles for women became more elaborate and an important sign of status it became necessary for slaves to create the latest fashionable hairstyles. These slaves were highly skilled and valued. The Roman slave hairdressers were called ornatrices. The content of this Roman Hairstyles category on Roman clothes worn by the people of Ancient Rome provides free educational details, facts and information for reference and research for schools, colleges and homework. 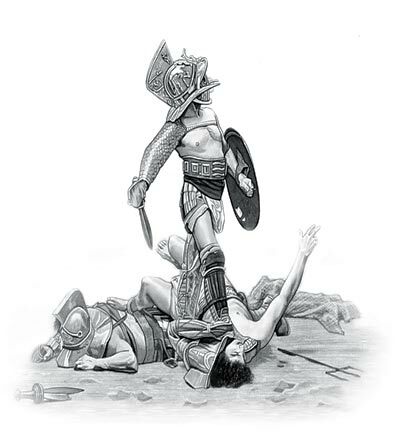 Refer to the Colosseum Sitemap for a comprehensive search on interesting different categories containing the history, facts and information about life and clothes worn in Ancient Rome.